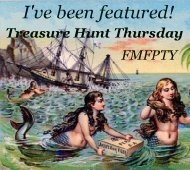 Welcome to Treasure Hunt Thursday #33!! I hope everybody had a blessed Thanksgiving with family & Friends! It is hard to believe December is upon is already! Anybody else feel like they are behind on their decorating though the onto has just started!? Well we had the largest turn out ever so far with THT so THANK YOU for coming over to the party an bringing your friends! Shenita from Embellishments by SLR redid this fabulous little shelf she found over at Goodwill! She is my kind of junking buddy! Aren't these lil' owls just darling!!?? You can learn how to make them over at Kayboo Creations! You can also learn how to make a reversible table runner over at Krista Sew Inspired! And since we missed last week I am throwing in an extra feature this week! I am in LOVE with this ice skate wreath!! I may just have to make one of my own! Thanx for the inspiration Alderberry Hill! As always thank you ladies and be sure to grab your "I've Been Featured" button!! Now on to this weeks party! As with all parties there are the normal rules. You must link back to From My Front Porch To Yours. Just common courtesy. If ya don't link back ya don't get to party. Only link up to your Treasure Hunt Thursday post and NOT your blog homepage. Please no advertising and please no more than three links from the same party goer. Also be sure to visit at least the link before you and after you to just say Hi! It makes partying all the more fun! 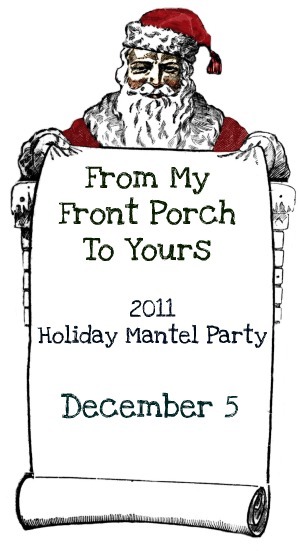 P.s Don't for get FMFPTY first annual Hoilday Mantel Party! The party will open at 8:00 pm Sunday evening! Great features! Shenita is my kind of junking buddy too. Hi Pamela, Thanks for being such a gracious hostess! Take care. Thank you for featuring my little owls. I love your site and was very excited to get your comment. #4, #5 and #6 will be joining the group Friday. Great features this week Pamela. I too love that wreath. Thanks for hosting. Pamela, thanks so much for featuring my shelf! I truly appreciate it! You made my day! I'm glad to link up again! Thanks for puttin on the party! Linked a few of my things but having trouble finding your button. Can only see the "featured" one. There is no HTML code for the others. Any ideas? Newest follower too! Thanks. Love your Christmas header - too cute. Thanks for hosting, Pamela. I always enjoy your party and seeing all the motivating inspiration. This week was no exception. I love those little owls! Too cute. Hey, Pamela! Glad to be linking up this week! 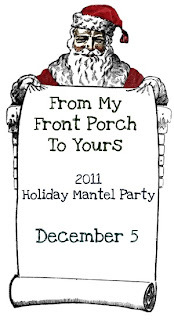 I just grabbed your mantel party button and am looking forward to linking up! Thank you! Those owls are so cute!! Thanks for hosting! Thank you so much for your party. I love seeing all the different creativity out there. Great features. I'm going to definitely check out the reversible table runner. I loved the star that was in that photo too. Your blog looks very festive. Quite a treat when I opened it!